Since we are still hovering around the changing of the years, I thought that I would sneak this one in quickly before we are well into 2013 when everyone will be saying 13 - get over it! This is why 2013 is going to be a special year!!!! 1. 13 degrees is the distance the moon moves around the earth each day. Lunar is so different from solar and worth a try for a change!! 3. The last supper had a table set for 13. There are people who believe that you should never set a table for 13 - it should be either 12 or 14. Enough said. 4. Tradition states that 13 witches are required for a coven. How many warlocks, I wonder? 5. A deck of cards has four suits of 13 cards each - not including the joker, again enough said! 6. Bakers need 13 to make a dozen and I am not sure why? Anyone remember the family movie series "Cheaper by the Dozen" ? 7. 13 is a prime number, a happy number and a fibonacci number - but you knew that!! 8. 13 was a lucky number for Wilt Chamberlain, Mats Sandin and Alex Alomar to name a few. 9. For those suffering from triskaidekaphobia, number 13 is not good. All phobias taken into consideration, including the phobia of long unpronounceable words - "trisk" - for short, tops them all!! Any bets on the number of children, born this year, who will get the nickname trisk? 10. 13 is the start of the terrible teens and a time of transition from childhood to adulthood in a number of cultures. 11. Many apartment buildings avoid using the 13th floor - the elevator skips from 12 to 14 - time to grow up or put the gym on the 13th floor. 12. Ireland this year has changed its car licensing practice. 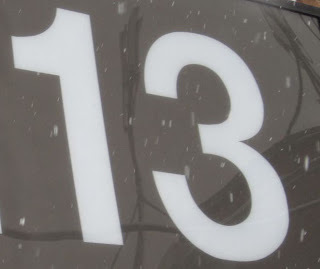 Instead of having cars bought in 2013 begin with 13 - they will begin with 131 - There was a concern that fewer people - read nobody - would buy a car in 2013, if their license plate began with the number 13. Maybe a good year to negotiate a great price for a car in Ireland!!! 13. 13 is a emirp number - a prime number that gives a different prime when its digits are reversed. Now 31 is something I hadn't considered!! It has to be one of those totally overlooked entities. In fact I can't think of anything that sets 31 apart. Why wasn't it considered as the meaning of life instead 42? Given that so many people go through life having missed it's meaning, I would like to propose 31 as the meaning of life!! Emirp is "prime" spelled backwords and Tink is "knit" spelled backwords, as in taking out stitches because of a mistake. This brings me to the brink of a new post - how many words can you reverse and still have a meaningful discussion. In fact, how many "things" can you reverse and still have meaning of any sort and how many mistakes can you correct by moving backwards. Then there are all the words that do not change their meanings in reverse like - rotor and radar - handy to know if you do cryptic crossword puzzles or want to avoid reversing, for whatever reason!! Loved this. What a clever idea and I had no idea of all those results from the number 13. Will that be Campbell, Gordon or Macdonald...?